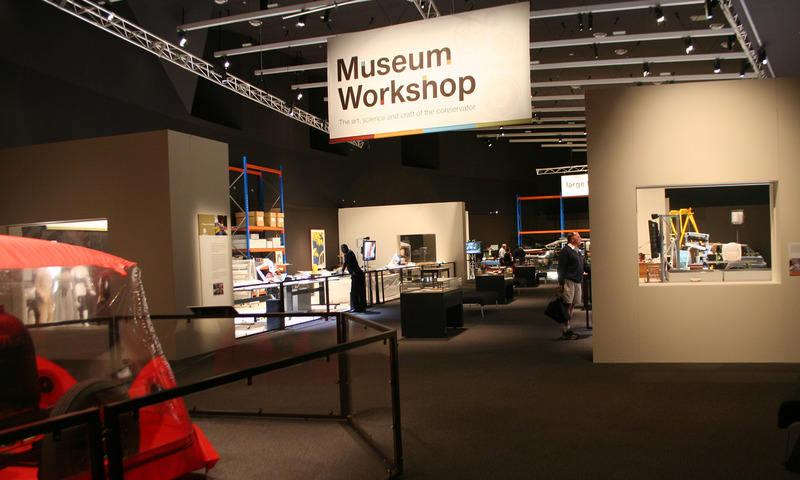 The Museum Workshop exhibition was a temporary exhibition developed to provide visitors with an in-depth insight into the ‘hidden’ workings of the museum and the art and science of conservation. The gallery was configured with three conservation laboratories, where visitors could engage directly with conservation staff, asking questions as they worked to preserve objects from within the museum’s collection. While exploring the range of skills, techniques and processes involved, this experience also revealed something of the wide variety of materials and objects that conservators frequently encounter. This was reinforced further through interactive elements, where visitors could make choices about conservation methods and materials, see the effects of their selections. This process guided them to a more informed understanding of conservation and preservation processes. A key object in the exhibition was the Royal Daimler car, which was gradually restored over the length of the exhibition. Other items varied from small clockwork to banners, dresses, photographs, paintings and a plethora of additional individual items. The exhibition served to give visitors a greater awareness and appreciation of the extensive, highly specialised work that is done by the skilled conservation staff at the National Museum of Australia.